It has been a painful day for me. Two pieces of news came in this morning: one about the massacre of an Yanomami settlement in the Amazon, and the other about Obama green lighting Shell’s drilling in the Arctic Ocean. Both are about resource wars that lead to killing—humans and/or animals, fast or slow, one to get gold, and the other to get oil. Subhankar Banerjee is a writer, photographer, and activist. Over the past decade he has worked tirelessly to conserve ecoculturally significant areas of the Arctic, and to raise awareness about indigenous human rights and climate change. 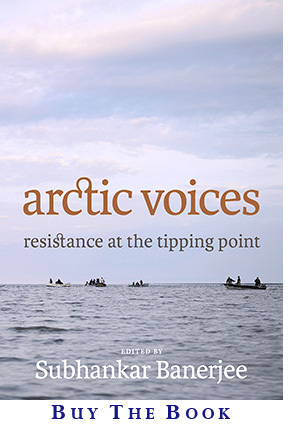 He is the editor of a new book, Arctic Voices: Resistance at the Tipping Point (Seven Stories Press) and won a 2012 Lannan Foundation Cultural Freedom Award. His Arctic photos can be seen this summer in three exhibitions, all our relations at the 18th Biennale of Sydney, Australia, True North at the Anchorage Museum in Alaska, and Looking Back at Earth at the Hood Museum of Art at Dartmouth College.